More images and a more general text will be added soon. 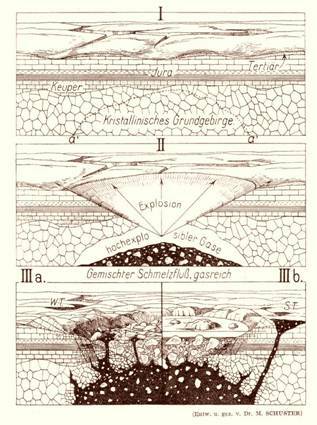 Below, you will see maps, an old volcanic-explosion sketch for the Ries crater, and a modern geologic cross section of the Ries impact structure. On the pages of the submenus you will find topographic maps and profiles, outcrop images, Ries crater typical impactites, peculiar impact deformations, shatter cones and this and that. 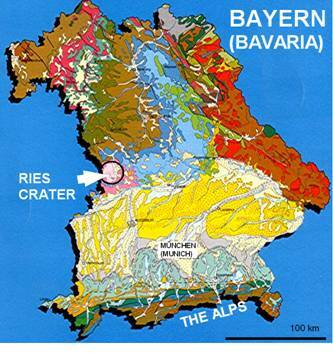 The Ries impact structure on the geologic map of Bavaria (1 : 500,000; by courtesy of Bayerisches Geologisches Landesamt). 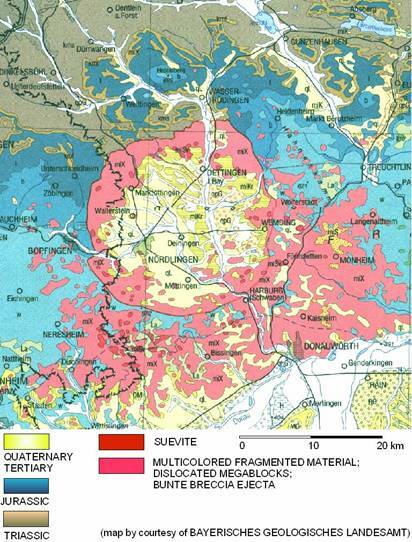 Geologic general map of the Ries impact structure. For more than 150 years: the Ries impact structure as a volcanic explosion crater. A modern model of the Ries impact structure based on geophysical measurements (see seismic-surveys/ and gravity-surveys/ and geoelectric-surveys/ and deep boreholes.